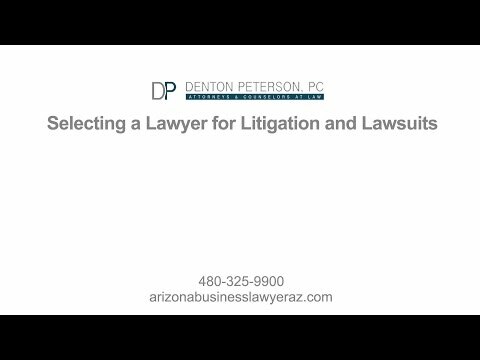 Tempe Business Lawyers & Corporate Attorneys at Denton Peterson, P.C. We understand what it’s like to be a small business owner. Between managing your clients and employees, overseeing your finances and tax issues, developing partnerships with other local businesses, and trying to market your services, you really don’t have a lot of time left over to deal with complicated legal issues — nor do you likely have the expertise. Our experienced and knowledgeable business lawyers are ready to take that burden off of you and give you the expert legal counsel you need to keep your business on the right course. Our Tempe corporate attorneys provide the counsel you need so you can keep your focus on managing and growing your business. One of the most important things you can do for the success of your business is to choose the right structure for it. For example, using a trade name for your business when you should set up an LLC or a corporation can leave you vulnerable to personal liability, putting you at risk of losing all your personal assets if you are ever sued. The structure you choose can determine the liability you face, the tax obligations you have, how you can make decisions for your business, and more. A business lawyer from our team will help you understand what entity is best to meet your goals for your business. Over time, your needs or your goals may change. In that case, one of our Tempe lawyers can help you determine if you need to restructure your business and can help you implement the change. With our assistance, your business can make a smooth transition and can meet all its legal requirements along the way. Choosing and establishing a business entity may seem simple, but it can be deceptively so. Any missteps in filing the paperwork, submitting the wrong documentation or failing to submit or file required documentation may cause significant issues later on with dramatic legal or financial consequences. Our Arizona business attorneys will ensure that you file the right paperwork and take all the right steps to establish the entity that is best for your situation, whether you are looking to start a new business or restructure an existing one. We assist clients who are already in Tempe, as well as out-of-state or out-of-country clients who are looking to establish businesses in Tempe. We also help with the selection and registration of trade names. Call Denton Peterson to talk with an experienced Tempe business lawyer about your needs. Arizona law requires some businesses to file annual reports and hold annual meetings to remain in good standing. You may also be obligated to report other business dealings, taxes and more to agencies including the Arizona Corporate Commission, the Office of the Secretary of State or the Arizona Department of Revenue as well as local government agencies. Not only can preparing and filing these documents be time consuming, but the process can also be complex. A corporate attorney from our team will help you stay on top of what documents you have to file and will help you put together and submit these documents. By taking care of these document filings for you, our attorneys ensure that you have met your legal requirements and we save you precious time that can better be spent on managing your business. As a business owner, you may be required to sign dozens, even hundreds of contracts over the lifetime of your business, including purchase or lease agreements, employment contracts, partnership contracts and more. Any small change to the language of a contract can make a big difference to your rights and obligations. Changing or adding just a few words in a contract can determine whether you are able to sue a negligent vendor and recover your losses and attorneys’ fees against a defaulting debtor, for example. An experienced corporate attorney from Denton Peterson will include in your contract the terms that protect your business interests. Our strongly drafted contracts will minimize your liability and protect you against loss. This is just a small list of the many types of contracts we can create. Our attorneys will also review business contracts that you are being asked to sign. With a tough legal advocate on your side, you can be sure that you are not signing anything that will put you or your business at risk later. Our attorneys will make suggested changes or can even draft a totally new contract that is acceptable to you. Whatever your contract needs, an experienced business lawyer from our team will be able to assist you. Our attorneys will help you to avoid litigation whenever possible by drawing up the right contracts and offering you the right legal advice to minimize your liability. However, if you are involved in a business dispute, a corporate attorney experienced in negotiation, mediation and litigation can represent you through any stage of the dispute, whether it actually reaches trial or not. Our team has an impressive track record relating to these and other litigation matters. For example, we helped a business whose inventory was destroyed by a fire and obtained a six-figure settlement for our client. We helped another business obtain a six-figure settlement from an insurance company that sold that business a policy that it didn’t need. Other success stories include getting emergency temporary restraining orders against individuals or entities violating confidentiality and non-compete agreements and convincing courts to dismiss lawsuits. We know how stressful litigation can be to a business, and we are dedicated to help your business avoid lawsuits through negotiation and settlement but we are also prepared and experienced to successfully defend you and your business against them. Call Denton Peterson in Mesa today to talk with an experienced business lawyer about your needs. Whether you are facing litigation or need a simple contract review, a corporate attorney from our team is ready to help you do what is needed to help your business operate as smoothly as possible. Call us at (480) 325-9900 or use our secure online form to schedule a consultation today. COMMERCIAL LEASE: Did you consider all potential pitfalls?